Acid mist generated by electrowinning metals from acidic electrolytes can be dramatically reduced with ECC Hollow Plastic Balls. The Copper refining technique of electrowinning generates oxygen gas at the surface of the anodes. This saturates the electrolyte and forms bubbles which rise to the surface and burst into the atmosphere. A fine acid mist is created, which is dangerous to human health and damages the building structure. Increased ventilation rates become costly, cause significant electrolyte temperature loss and merely transfer the contamination outside the building. 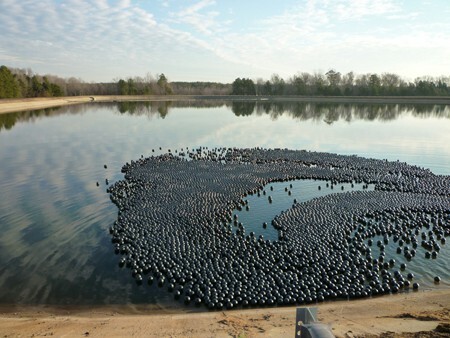 Although several techniques have been employed in attempts to solve these problems, none offers the performance and flexibility of a ECC floating blanket of 3/4″ (19mm) hollow polypropylene balls. Forming a layer up to four balls deep, most of the acid mist particles impact or condense on the ball, then return harmlessly into the liquid. The balls allow unobstructed retrieval of the cathode and will not become trapped on the copper deposits. The thermal insulation qualities of a ECC floating ball cover can reduce heat loss by up to 70% depending on the liquid and ambient temperatures. Process liquid temperatures can also be maintained at optimal operating conditions more easily. Typically, three layers of 19mm (3/4″) diameter balls are recommended. Approximately 2,900 balls cover 270 ft2 (1m2) with a single layer. Recent tests have suggested that further improvements can be obtained by mixing 19mm and 10mm balls in a volume ratio of 70/30.